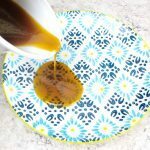 How to make your own homemade pancake syrup if you ever run out! This recipe is great to know about for those days when you wake up and decide last-minute to make a big batch of pancakes. You may find that you even like it better than store-bought syrup! Combine all ingredient in a glass measuring cup. Stir. Microwave for 1 minute, stir, then microwave for 1 more minute.